Tens of thousands of people in California are injured badly enough every year in dog bite attacks that they need to report to the emergency room for treatment. There is no telling how many of them should bring California dog bite attack lawsuits against the owners or those otherwise responsible for the dogs that attacked them. 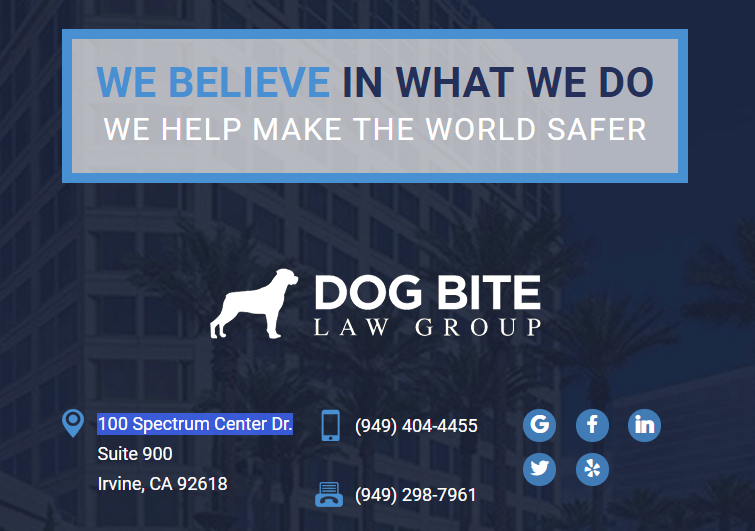 Those who contact an Orange County Dog Bite Lawyer to begin evaluating your case are able to determine whether or not they should proceed against the party or parties responsible for their injuries. Too many people never obtain this evaluation, and they are left to pay for the costs they have incurred on their own or they collect much less in damages than they deserve. Do I have a Dog Bite Attack Case? The dog bite attorneys at the Dog Bite Law Group would like to help people avoid making the mistake of not contacting an attorney for help after being injured by a dog. We’d like to do so by offering some basic information regarding how these cases are generally evaluated from a legal standpoint. Perhaps this will help someone understand that instead of just hoping for the best, they need to contact an attorney for help. Every dog bite attack case is different. There are different facts, different people involved, different dogs involved and different injuries that result. That’s why every potential California dog bite case needs to be evaluated thoroughly and carefully by an experienced California dog bite attorney. Below are 5 different criteria that are often used to help an injured person decide whether or not to proceed against those responsible for their injuries. Where did the dog bite occur? Was it on public property? Were you trespassing at the time? Did you know the dog? What type of dog was it? What, if anything to your knowledge, could have provoked the attack? What did you do during the attack? What did you do immediately after the attack? Did you obtain medical attention? Every lawsuit depends on the facts as much as the law, and that’s where an analysis of a dog bite injury needs to start. When putting together the facts of the situation, it is helpful to be able to identify any witnesses to the incident. These people will obviously be able to corroborate what happened if it’s clear that the injured person was wronged. Witnesses could also include people who didn’t necessarily see the incident but who knew of the dog’s propensity for attacks. Secondly, a dog bite case evaluation will depend on the potential liability of the prospective defendant. Fortunately, this is a relatively simple analysis in California because it is a strict liability jurisdiction in this regard. What that means is that if the dog bit and injured a person, that dog’s owner is liable absent some exceptions. You don’t need to prove negligence or intent. A dog bite attack should also involve an analysis of whether or not the dog’s owner, or the person otherwise responsible for the dog at the time, had insurance coverage at the time of the attack. While the absence of insurance does not necessarily preclude pursuing a legal claim, as a practical matter it could limit what the injured person could recover. Generally speaking, homeowners will have insurance coverage and many renters will have insurance as well, but it’s still helpful to know what’s happening in that regard as it almost always raises the level of the potential recovery. There are others, but these are the most common types of damages. You don’t need to know the amount of damages that could be on the line, as a California dog bite attorney can help you come to an understanding in that regard. You just need to have incurred them, and those losses could include those that will arise in the future. If you or someone you love has been injured in an attack, you need the help of a California dog bite attorney who will be evaluating your case and your potential claim for you, helping you decide how you should proceed. You can do that by contacting the Dog Bite Law Group today to schedule a free initial consultation.